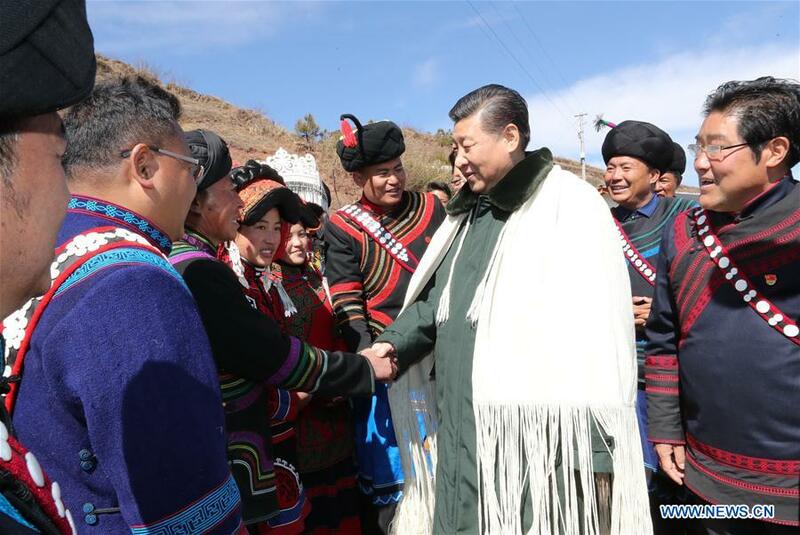 ZHAOJUE, Sichuan, Feb. 12 (Xinhua) -- Chinese President Xi Jinping pledged to "exorcise the evils of ignorance, backwardness and poverty" during his visit to ethnic villages in Sichuan Province in southwest China. While visiting homes of impoverished villagers of the Yi ethnic group who live deep in the Daliang Mountains of Zhaojue County, Xi, also general secretary of the Communist Party of China Central Committee, called for efforts to win the battle against poverty. He stressed that not a single ethnic group, family or individual should be left behind in the building of a moderately prosperous society in all respects in China, asking local officials to make unremitting and down-to-earth efforts in poverty alleviation. A Yi ethnic villager told Xi that she used to think that she was infested by some "evils" when she was ill in the past until she was told by village officials that the evils were just bacteria incurred by unsanitary lifestyle. "Evils did exist in the past. They were the evils of ignorance, backwardness and poverty," Xi said. "Once the people begin to lead a more civilized, healthier and better-off life, the evils are exorcised." "Would you like to sing?" Xi asked a 10-year-old girl after learning that she was fond of singing. "Yes," the girl replied and sang. Xi applauded and praised her good singing. Before leaving the county, Xi, wearing Yi ethnic apparel, shook hands and said goodbye to the villagers. In their ethnic language, the villagers expressed their thanks, New Year greetings and best wishes to Xi.